Lhind has been on the run all her life. Stealing what she needs, using magic for disguise, she never stays anywhere long. Lhind even has secrets from herself, for she has few memories, and those are troubling. But life is good until she gets caught by Rajanas the warrior-prince, Thianra the bard, and Hlanan the scribe. And that’s when adventure begins, because someone very powerful wants them all dead. 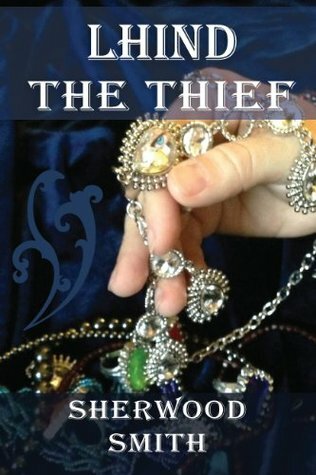 As they evade pursuit and work to uncover their enemies, Lhind struggles with the invisible bonds of friendship and trust, while Hlanan begins uncovering her secrets one by one. Then she finds that he has secrets, too. This fantasy with a dash of romance takes place in the same world as A Posse of Princesses and the Wren series. Remember when fantasy could be sheer fun? When a story could play in a sandbox that had no love triangles, angsty drama, or deeper religious or political meaning, and felt no need to wallow in blood-soaked grimdark misery? Well, if you’re a reader who misses those bygone stories – a reader who loved old school Mercedes Lackey or Anne McCaffrey, say, or even Dawn Cook (aka early Kim Harrison); or if you’re a reader who just would rather poke themselves in the eye than read another angsty love-fest in pantyhose-thin fantasy trappings, then this one is for you. And for me, as I had a heck of a lot of fun reading it. Really this story made me nostalgic, in all the best ways: a thief on an adventure, with magic up her sleeve and a secret beneath her hood; sword-fights, daring escapes, magical discoveries, and even a quiet, understated romance – it was like all my favorite old trope-friends had come out to play, and I realized all at once how I’d missed them. But while the type was decidedly familiar, this story was most definitely not one I’d read before – Lhind’s secret turned out to be far more interesting than just that of a girl masquerading as a boy, and I really enjoyed watching as the orphan thief, equal parts jaded and naive, slowly began to dare trust the rag-tag group of nobles she’d fallen in with. And really, who doesn’t like an adventure story where the fate of a kingdom hangs in the balance? Now, were there things that stretched credulity a bit? Sure. Could I have balked at the somewhat convenient way Lhind gets randomly swept up in the adventure (as one does), or the multitude of ways in which she turns out to be The Special One, whose actions will decide all? Yep, I could have, if I had wanted to stop and poke holes – but the thing is, I never did. Not once. I was just having too much fun, rollicking along on this adventure – and there was enough to it all, from character flavor to plot capering, to keep me highly entertained. Plus, I really am just a sucker for bouncy fun of the determined-leading-lady-saving-the-day variety. So, is this book going to be a startling revelation? Not really. Will it change your life? Probably not. Is it the kind of fantasy romp that is just downright fun to read? Absolutely. And it’s also the type of story I really, really have missed – and frankly I think it’s the type of story that people don’t really know what to do with anymore. They don’t know how to market it, or even where to shelve it – I’ve watched in amusement over the years as fantasies like this have migrated from adult fantasy sections to YA and back again, and frankly they just seem to get lost in the grey areas in between (which is why Sherwood Smith self-published this one). So no, this story isn’t dark or gritty; it’s not angsty or sweepingly romantic, it’s not soapy, and it’s not a sprawling epic of epics – and hey, look at that, there is fantasy life outside those trendy types. So yes, it was just really fun to read a story of the escapist, satisfyingly-comprehensive-but-hardly-deep, variety once more. So welcome back, old friends. I’ve missed you. Harmless but entertaining fluff. Just what the doctor ordered.